A small, slimy, bright yellow Vaxcap. Cap convex but soon expanding, center a little depressed, margins decurved. Gills decurrent, bright yellow with a slimy, hyaline edge. Stem yellow. Gloioxanthomyces vitellinus (Fr.) Lodge, Vizzini, Ercole & Boertm. Syn. 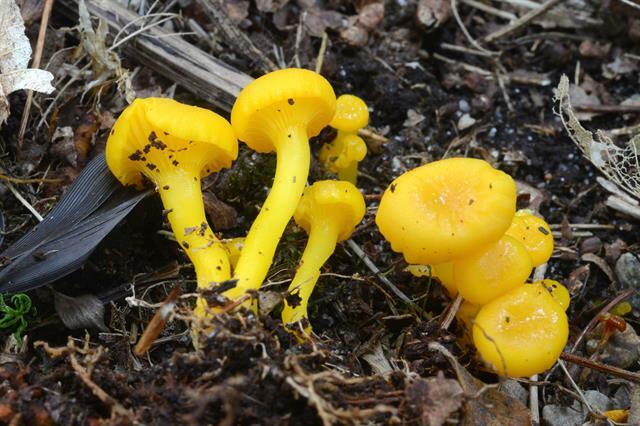 : Hygrocybe vitellina (Fr.) P. Karst. ; Hygrophorus vitellinus Fr.